Product weight is 1.25 lbs. Martin Mc Donagh's "In Bruges" proves at least one thing once and for all: Colin Farrell is a thoughtful, emotionally open, soon to do very great things on the screen, actor...something that anyone who has seen "Tigerland" and "Home at the End of the World" already knows despite evidence to the contrary: "S.W.A.T," "Alexander," "Miami Vice," etc. etc. 'If I'd grown up on a farm, and was retarded, Bruges might impress me. But I didn't, so it doesn't" says Ray (Farrell) to his fellow hit man, Ken (burly Brend..
How to describe this deceptively simple film is the hardest place to begin. 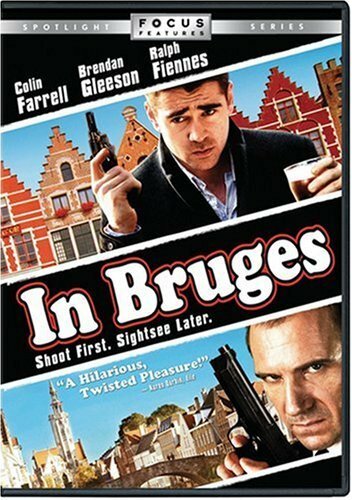 The plot's fairly simple: Two Irish hit-men, Ray (Colin Farrell) and Ken (Brendan Gleeson), are sent to Bruges (in Belgium) to wait out the consequences of an assassination gone terribly awry.The younger of the two, Ray, is bored and angtsy with the whole place. He's got a guilty conscience, having been the bloke who totally screwed up the hit. Ken, older and more sanguine about the whole matter, is the total opposite. He's enjoying..
Devyn Quinn (Texas) - S.. It's a fairytale town, isn't it? How's a fairytale town not some..
Two hit men, Ray (Colin Farrell) and Ken (Brendan Gleeson) are on a sort of makeshift holiday in Bruges, Belgium after a hit gone wrong. While awaiting word from their boss, Harry (Ralph Fiennes), Ken is interested in sightseeing and the history of the place, while Ray couldn't be more unimpressed and can't wait to escape.After hearing so many wonderful things about this film I was absolutely prepared to be let down. Movies rarely live up to the hype for me, but I am happy to say this one did and then som..